Neil Cornrich & NC Sports, LLC: Should Rams try to trade Jamon Brown with Austin Blythe dominating? Should Rams try to trade Jamon Brown with Austin Blythe dominating? The Los Angeles Rams were hit with some bad news this offseason when Jamon Brown was suspended two games for violating the league’s substance abuse policy, stemming from a 2017 arrest. It was a disappointing development, especially after seeing the same five offensive linemen dominate for 15 weeks last season. 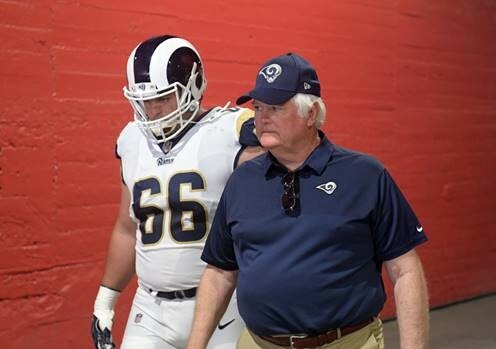 However, the Rams were prepared for Brown’s suspension and had Austin Blythe waiting in the wings. He was the odds-on favorite to replace Brown for the first two games of the season, and he did exactly that. Blythe was PFF’s highest-graded right guard in the NFL last week against the Raiders, earning a place on the Team of the Week for Pro Football Focus. On Sunday, he was equally good, clearing running lanes for Todd Gurley and Malcolm Brown, while also providing excellent protection for Jared Goff. He’s been better the past two weeks than Brown was at any point last season, which begs the question: What should the Rams do now? Brown’s suspension is officially over and he can return to the team as of Monday. That’s good news, but it also puts the Rams in a tough spot. Similarly to the way the Bucs have to decide between a hot Ryan Fitzpatrick and Jameis Winston when he returns in Week 4, Sean McVay has to either pull Blythe or keep Brown benched. There is another option, though. The Rams could attempt to trade Brown to a team seeking a short-term rental at guard with the potential for a long-term connection. And no, that isn’t the slogan for a bizarre offensive line dating site. Brown is in the final year of his contract and the Rams are likely to focus their resources elsewhere this coming offseason. Brown won’t command top dollar by any means, but with Marcus Peters needing a new deal soon, Rodger Saffold and Lamarcus Joyner hitting free agency and Ndamukong Suh’s contract expiring, it’s easy to see why the Rams might not pay up to keep Brown. That in its own right makes this trade very attractive from their perspective, especially with Blythe dominating thus far and Joseph Noteboom also on the roster. The Rams have enough flexibility on the offensive line to get by without Brown on the roster, just as they have the past two weeks. Even if the Rams are able to recoup a sixth-round pick, it might be worth considering trading Brown. That’s likely more than they’d receive in compensatory picks if Brown were to leave next offseason, so why not bring in some assets for the 2019 draft? He carries a cap hit of $1.87 million in 2018, so he’s not exactly a bargain when compared to Blythe’s $630,000, but that contract could preclude some teams from making a deal. Keeping him on the roster and paying him that amount of money to be a backup isn’t ideal for Los Angeles, but it could be the very reality it faces. In the end, it’s going to be difficult to move Brown, who’s merely an average guard. However, a team desperate for help at guard like the Texans or Bills could make a call and gauge the Rams’ interest in moving the lineman. If no move is made, the Rams will need to waive someone to make room for Brown, or place a player like Mike Thomas on injured reserve.